Emily graduated from the Royal Northern College of Music Masters programme last year, with Distinction, under the tutelage of John Bradbury and Lynsey Marsh. Whilst at the RNCM Emily won the Gilbert-Fell prize for solo performance, a Music at Beaulieu Award and Third Prize in the Virovitica International Clarinet Competition. It was at the RNCM that Emily met Lydia and Jo, and began exploring the wealth of clarinet chamber music with them. This included works for clarinet quintet, wind sextet, and the clarinet and piano and clarinet trio pieces you will hear today. Emily is a keen chamber musician and frequently works with her wind quintet, ‘North Winds’, performing to children who have little exposure to classical music. 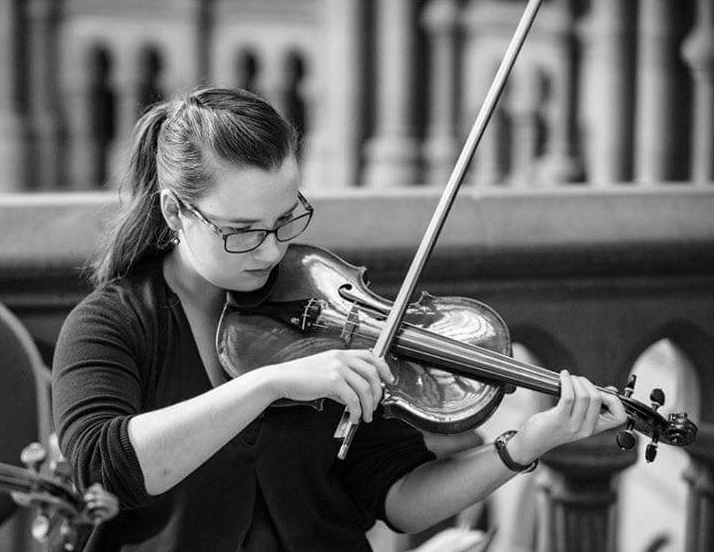 As well as chamber music, Emily’s hugely enjoys orchestral work. She has played in the Hallé orchestra, Royal Liverpool Philharmonic Orchestra, Royal Philharmonic Orchestra and the CBSO this year. Getting children excited about classical music is also extremely important to her, and as a result she currently teaches at Repton School and Clitheroe Royal Grammar School. Jo's musical journey began with violin lessons at the age of 8 years old. She went on to study for 5 years at the Royal Northern College of Music under the excellent tuition of Catherine Yates. She successfully gained an Undergraduate Bachelor of Music in 2014 and with the generous support from the Riga Heesom award went on to complete a Postgraduate Diploma at RNCM in 2015 before settling down in Manchester to pursue a career as a freelance musician and instrumental teacher. She enjoys teaching a combination of both piano and violin to a mixture of all ages, both privately and at Sheffield Music Academy. She has a passion for ensemble playing of all kinds, frequently performing with various orchestras, including the Hallé Orchestra and the BBC Philharmonic. Lydia is 23 years old and has played the piano since the age of nine. She sang as a chorister in Lincoln Cathedral Choir for six years, and won several prizes in the Lincoln Music and Drama Festival – for piano, singing and flute – including a bursary for a summer school in Haileybury. In 2009, Lydia achieved 145 marks for her Grade 8 piano exam which earned her the Associated Board Award for the highest mark in the whole of Britain and Ireland. She performed her first solo piano recital in 2009. From 2010 Lydia attended Chetham's School of Music in Manchester, and in July 2011 was awarded First Prize at The Chetham's Piano Competition in association with Yamaha. In October 2011 she also competed in an international piano competition in Rome, shortly before taking her DipABRSM in Piano Performance. Lydia has recently graduated from the Royal Northern College of Music, where she has performed in numerous concerts, including performances with the RNCM Big band. She hopes to develop her jazz skills further. The trio will be performing pieces by Weiner, Kreisler, Bartok and Brahms. Our concerts usually begin at 12.30pm. Tickets for the concerts are £5* and are available on the door. The church and its shop/café (The House on The Rock) are also open all day, so you are welcome to browse amongst books, cards, gifts and CDs or enjoy light refreshments before or after the concert. WANT TO PERFORM AT ONE OF OUR CONCERTS? Many of our artists return each year to perform for us, however we are always interested in hearing from new talented musicians. We are able to pay a modest fee to those who perform. *Admission is normally £5.00, but occasionally this may be increased for a particular concert. Pay at the door and get a programme of the music, biographical details of the performers and advance notice of future concerts.